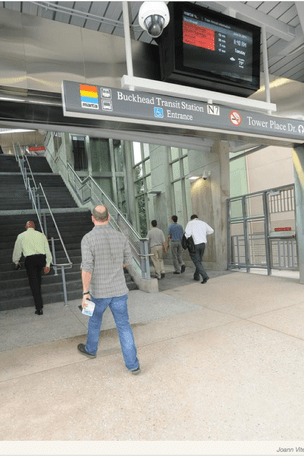 MARTA’s new pedestrian bridge in Buckhead. Two apartment towers and an office building are under construction around the station. MARTA’s latest announcement of its intent to allow developers to build “vibrant, mixed-use Transit Oriented Development” above the North Avenue, Midtown, Arts Center, and Lenox stations feels exhaustingly overdue. Thanks to MARTA’s leadership and concentrated efforts by a handful of smart growth organizations over the past three years, the ball is finally teed up for transit-oriented development (TOD) along the Peachtree Corridor. The decision to consider 99-year ground leases with developers—or possibly the air rights in fee simple—while bafflingly late in their legacy as owners is a savvy business move. It’s also arguably made at precisely the right time. Atlanta’s intown submarkets continue to mirror urbanization trends across the county as creative class tenants (and a few owners) are drawn to walkability, proximity to work, and cultural density. Midtown and Buckhead are the strongest submarkets in metro Atlanta, with multifamily continuing to outperform every sector.